Dubai is a hot place for all types of businesses and professions. According to the latest policy adopted by UAE in general and Dubai in specific, special privileges are provided to professionals of foreign countries. In order to implement the newly adopted knowledge-based economy, investors and professionals of various scientific fields are provided 10 year residential visa and other incentives. It means the government of UAE (and Dubai) wants to bring qualified professionals from around the world to their country. Most of the population of Dubai is comprised of foreigners. But many among these are unskilled laborers. The government wants to balance this situation with the arrival of more skilled and highly qualified persons. Medical professionals are also among those that are warmly welcomed in the country. In fact, Dubai provides one of the best healthcare facilities in world at competitive costs. It makes Dubai an important destination for medical tourism. This clearly means there are lots of opportunities for any business related to medical and healthcare. The government of Dubai is always ready to assist investors and professionals of general medical and dental care. It is not possible for any country to provide all types of healthcare facilities through government-controlled hospitals. Therefore, it is allowed for healthcare professionals to open a Dubai-based private general clinic or dental clinic. These opportunities are available in both Dubai mainland and specific free zones (especially Dubai Healthcare City). Dental professionals are usually less in number as compared to general health professionals. But they have same importance. Many people visit them not only for medical but also for beautification purpose. Therefore, it is expected that opening dental clinic in Dubai has more prospects than most of other places due to its well off local and foreign population. Therefore, if you are a dental expert or professional, then it is quite beneficial to setup up your dental clinic in Dubai. It is due to encouragement and cooperation from government and presence of large number of wealthy citizens, foreign residents and tourists from around the world. But the government of Dubai never compromises on providing best health facilities to its citizens and residents. For this purpose, there are specific rules and guidelines designed for opening a dental clinic in Dubai. These rules are strictly enforced. So, they must be taken into account before starting a dental clinic in Dubai. Few rules and conditions may be different for Dubai mainland as compared to free zones including DHCC. But generally these are same for all types of locations in Dubai. These dental clinics are managed by Ministry of Health (MoH). Dental health professionals have to attain license from Ministry of Health UAE before opening a clinic in Dubai and any other emirate of UAE. 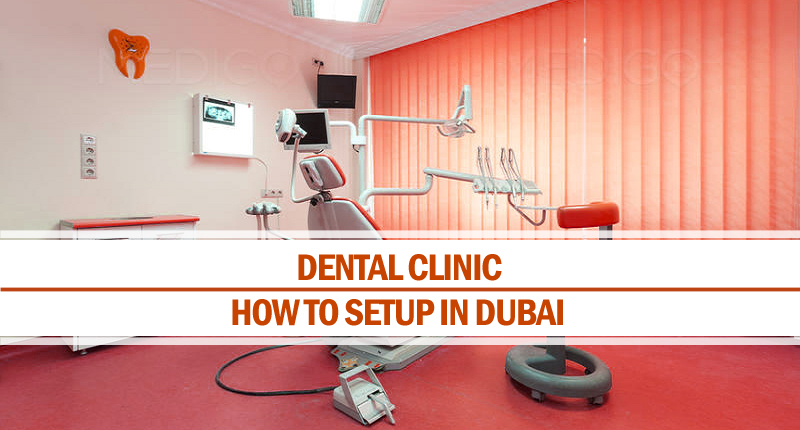 Following are important rules and guidelines that should be followed before and after setting up a dental clinic in Dubai. Setting up dental clinic in Dubai is not only beneficial but it also required several prerequisites. In order to get complete information and make this dental clinic setup process easy and quick, you can contact Riz & Mona Consultancy. We will provide complete assistance and information regarding setting up dental clinic in Dubai mainland or any free zone in Dubai.